The American Dietetic Association released the 2010 Dietary Guidelines in January. These guidelines urge Americans to be aware of portion sizes and select more nutrient-dense foods. Color matters in fruits and vegetables. Whole grains are good for the body. Low-fat dairy products and select lean sources of protein are excellent choices. Students in the Community Nutrition class will host tours in the Hornbacher’s in Moorhead April 11 through 16 to help people choose healthful foods while shopping in the grocery store. 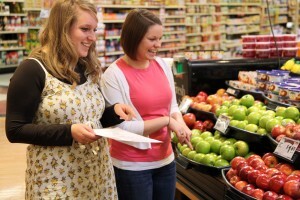 The students want to show people how to select healthy food while wandering the many aisles of choices at a grocery store. The tours will stick to the outer perimeters of the grocery store, rather than perusing the inner aisles, to find fresh and nutrient dense foods. Dr. Betty Larson, nutrition and dietetics professor, teaches the Community Nutrition class, which is comprised of mostly seniors. The class is required to identify a problem, propose a solution and then do an experiment to see if it works. “The class noticed there are students on campus who don’t know how to shop,” she said. Each year the students in the Community Nutrition class have to stage a community intervention. Larson provided the class with a few ideas of what previous students had done, and the class loved the idea of grocery story tours. Pierce said many people find it difficult to know what information is true or not concerning nutrition. Senior Kendra Vipond said these tours are realistic and practical, especially for college students. The tour will discuss the various benefits of fruits, vegetables, nuts, meats, fish, oil, dairy, eggs and whole grains. The tours will begin with a short description of fruits and vegetables. Choosing a variety is important because dark-green, red and orange fruits and vegetables are full of many disease fighting compounds called phytochemicals. The 2010 Dietary Guidelines recommend 1.5 to two cups of fruit and two to three cups of vegetables per day. The tours then move on to the topic of nuts, which are one of the best plant sources of protein. Meats and fish are the next topics. The recommended serving of meat is two to three servings a day, with one serving being about the size of a deck of cards. Fish is a good source of protein and omega-3 fatty acids, which can reduce blood pressure, prevent clot formation and enhance immunity, among other things. The American Heart Association recommends eating fish at least two times, for a total of two servings, a week. Dairy products help to maintain both a healthy body weight and blood pressure, reducing the risk of osteoporosis. The recommended servings per day involves three servings for Americans ages nine years and older. Whole grains are another topic because they are a good source of dietary fiber, which helps provide a feeling of fullness with fewer calories. The guidelines recommend consuming at least half of all grains as whole grains. Senior Allie Hanson said this will be helpful for students to see how to choose foods in the grocery store off campus and outside of DS. Hanson said one common misconception involves good foods and bad food habits, such as eating out at restaurants or getting desserts. Larson said the class has worked with Hornbacher’s several times in the past, so it seemed logical to choose them when deciding on a grocery store. She also had numerous goals in mind for this project. During the week, 20-minute tours will take place at 10 a.m., 3 p.m. and 7 p.m., while the tours during that Saturday will take place at 9 a.m., 10 a.m. and 1 p.m. This event is free and open to the public.